Carb Othello Pastel Pencil Set in a Metal Tin - Each gorgeous set of pastel pencils comes in a metal box. It also includes a paper blending stomp, a kneaded rubber eraser, and a pencil sharpener. 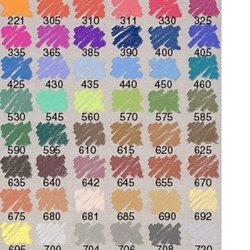 The chart at the right was done on Wallis Belgium Mist paper, just to show you how these colors can literally jump off of the paper! You will love these pencils!